The 17th century connection between Mill Farm and New House Farm concluded with the marriage of James Pullen to Mary Berry in 1708 (The Berry family had been the village butchers). James, his wife and his mother all died within few years of 1740, while his sons were farming elsewhere. The hiatus was filled by William Pullen of Tower Hill Farm who married Hannah Smith in 1742 and moved into New House about 1745. Their son James married Elizabeth Hawkins in 1770; carve on a barn is JP 1791. She brought Hawkins's into the Pullen family as her marriage settlement. They had eight children. The younger William (1788-1801), married and moved to The Laurels in Itchington which became vacant about 1828, and the Pullen line continues there to this day. The eldest son, James, had only one child, a daughter Mary, who in due course became the heir to the New House property. In 1822 she married Edmund Cornock of Thornbury. The Cornocks were a prominent West Country family, originating in the neighbourhood of Berkeley. Edmund living at Oldbury before his marriage, but it seems likely that when his mother-in-law died, he and Mary lived at New House for while, for he paid the Land Tax on the property in both 1825 an 1832. But the farm, of 56 acres, was subsequently let for many years while Edmund and Mary lived at Acton Lodge Farm, Iron Acton. William Roberts was an early tenant, followed by his son Richard, and in the late '40's and early 50's the tenant was John Sainsbury junior who was already farming the 200 acres of Edwards Farm. Then for the five years from 1853 to 1857, Edmund paid the Church Tax on New House. Acton Lodge seems to have been their main home, though six of their nine children were baptised in Tytherington Church. E dmund died in 1857 and was buried in Iron Acton; Mary his wife suffered a fatal fall on the day of the funeral. 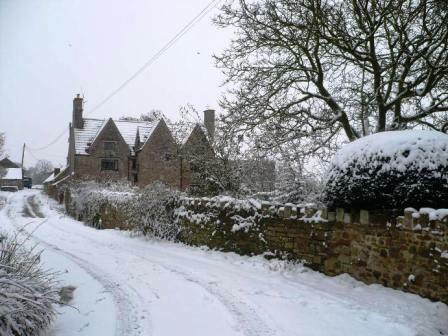 For the next four years, Edmund's middle son (of five), William, ran New House Farm; four children were baptised in Tytherington before he left and later settled in Bristol. William's eldest brother James Pullen Cornock, farming at Rudgeway, then moved to New House in 1862, (though JPC 1858 is carved on a barn timber). His first three children, Edmund, Julia and William had been born at Rudgeway, but the last, Minnie, was baptised in Tytherington in 1863. During this period, James was farming 100acres, employing a man and a boy (as well as two indoor servants). James died in 1887, a year after his wife, and was followed at New House by his son William Pullen Cornock, who had recent married Frances, daughter of Thomas Drew at Stidcote Farm. This was an extremely difficult period for farmers, financially, and the future of the farm was in jeopardy. But he pulled through, playing a prominent part in the life of the community and serving for 20 years as churchwarden. He died in 1939, aged 80, only a few months before the death of his eldest son Seymour. The succession then was to his second son Thomas, already 51 and with three children. The son, William H G Cornock, inherited the farm when his father died in 1975, aged 87. 'Bill' Cornock passed away in May 2016. 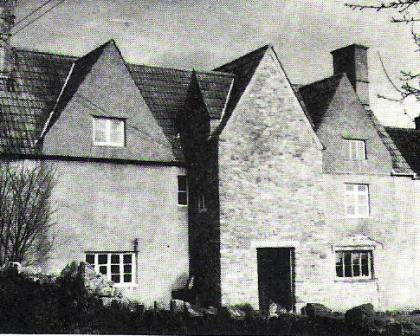 Photograph left of New House Farm c 1975. The basic layout of this Grade 2 listed farmhouse has remained virtually unchanged since it was built some 350 years ago. A full architectural study of New House Farm can be found in Linda Halls Rural Houses of North Avon and South Gloucestershire, 1400-1720. Read more about New House Farm and the medieval cloth trade HERE.